I made some pork tacos for dinner recently and I thought it would be fun to do a different type of salsa. 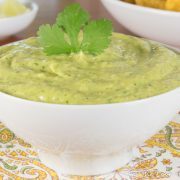 I love the flavor of tart tomatillos with pork so I decided to make an avocado and roasted tomatillo salsa. 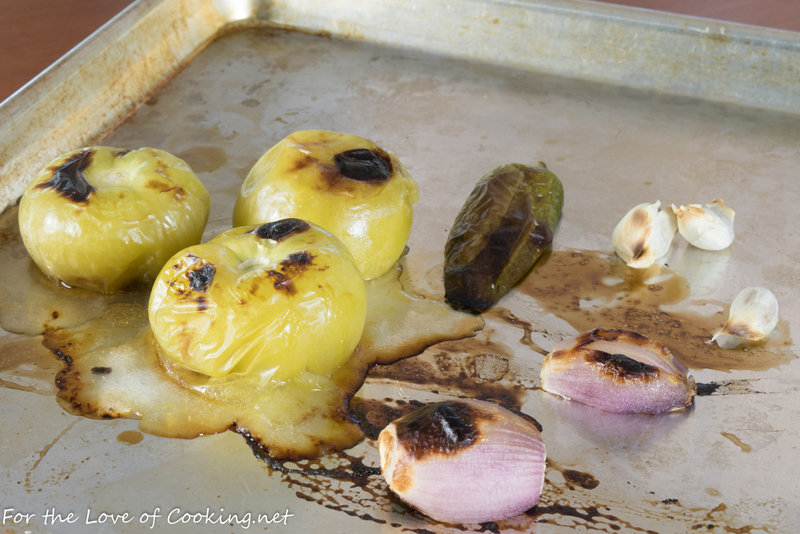 Not only did I roast the tomatillos, I also roasted the shallot, jalapeno, and garlic cloves in the hot oven on a dry baking sheet until they were a bit charred. After they cooled completely, I tossed them all together in a blender with some creamy avocado, lime juice, and some seasonings. The tart, creamy, smoky salsa was a HUGE hit with all of us! It was a bit too spicy for my son but he loved how much lime was in there. This avocado and roasted tomatillo salsa was delicious with the pork and it paired nicely with the Mexican corn salad that was served with the tacos. Place the tomatillos, shallot, garlic cloves (skin on), and jalapeno on the baking sheet. Place into the oven and roast for 10 minutes, tossing to coat all sides of the veggies until a bit charred and softened. Remove from the oven and allow to cool completely. Once the veggies are totally cool, place them all into a blender, making sure to remove the garlic skin first. Add the avocados, cilantro, lime juice, pinch of cumin, and sea salt, to taste. Blend until creamy and smooth. Adjust seasonings and lime juice to suit your tastes, if needed. Serve with chips. Enjoy. Place into the oven and roast for 10 minutes, tossing to coat all sides of the veggies until a bit charred and softened. Once the veggies are totally cool, place them all into a blender, making sure to remove the garlic skin first. Add the avocados, cilantro, lime juice, pinch of cumin, and sea salt, to taste. Adjust seasonings and lime juice to suit your tastes, if needed. I seriously can eat the whole bowl at one go! So creamy, so good! Looks like a fine creation Pam. 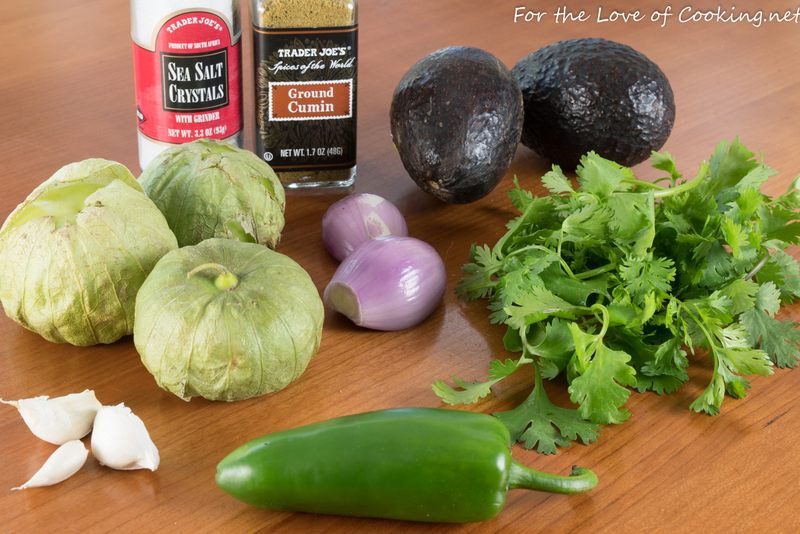 Salsa verde is a favorite of mine as is guacamole, but I would have never thought to combine avocados and tomatillos – great job and we will try it. Looks good! When are tomatillos in season and how do you tell if they are ripe? Here is an informative article about tomatillos… hope it helps. Tomatillos have such a neat flavor! Love ’em. And they combine well with avocado. Wonderful looking salsa — thanks. What a delicious combination. I bet it tastes great with grilled meat. 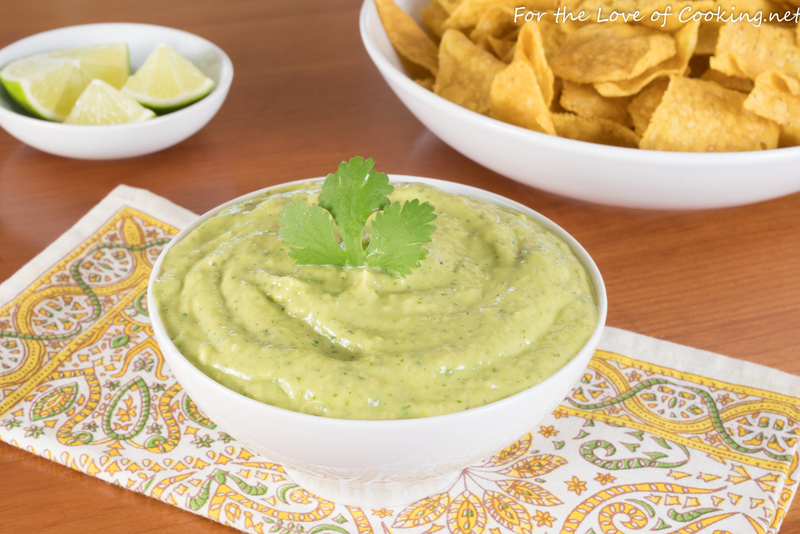 Costco has a tomatillo avocado salsa that may family liked, but this looks sooo much better! Super simple recipe too which I love, I’m going to have to try this out, thanks! Love this sauce ! Looks wonderful !! 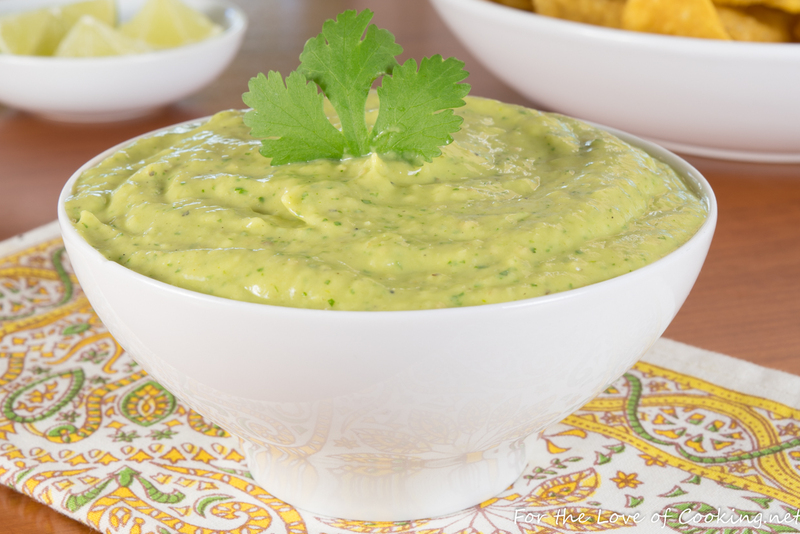 this is way better than any ol’ guacamole! the roasty-toastiness of those ingredients really makes it special!